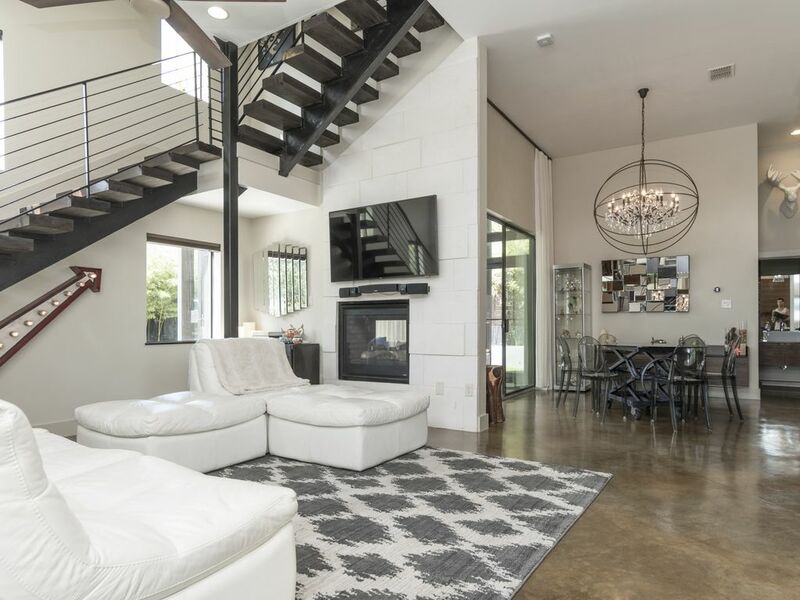 This two story modern townhouse is the perfect getaway to enjoy everything Austin has to offer. With a huge open concept layout, 15 foot ceilings, and plenty of natural light, the spacious living area is perfect for entertaining. With over 70 Hue color changing lightbulbs, Sonos sound system, Apple TV systems, automatic window shades, and many more automations, this smart home makes your vacation a breeze. Best of all, it’s easily controlled from a single device. The chef’s kitchen has everything you need to handle meals of any size like a pro, while the dining room offers a great place to gather family and friends for dinner. There’s also a fully stocked game cabinet for a fun night in. When you’re ready to have some fun in the sun, step outside through the sunroom and take a dip in the gorgeous 20,000 gallon, 8 foot deep pool. There are also plenty of lounge chairs in the yard to help you build your tan! The 8 seat spa hidden behind the waterfall is the perfect way to unwind after a long day. Whether you're relaxing in the beachfront entry, sliding down the water slide, or listening to the waterfall around the fire pit, being poolside is the best way to beat the heat. The media room upstairs offers a cozy place to watch movies or hone your video game skills. Step out onto the huge balcony to enjoy panoramic views of Austin, congregate around the large seating area, or enjoy a meal outdoors around the dining table. The second guest bedroom and bathroom are on this level, as well as the master suite. Retreat to the master bedroom to enjoy views of St. Edwards, or the master bath for the large soaking tub and shower for two. Relax on the Spacious Balcony with stunning panoramic views of Downtown and St. Edwards. All towels are provided in each bathroom. Located in the Kitchen under the center island on the left side. Airplay is available on all Apple TVs Sonos System is in all common areas. The house was very clean and well kept. We really enjoyed our stay. The house was beautifully decorated on the interior and had everything to meet our needs. The pool area was a perfect plave to relax and enjoy the beautiful weather. Jonathon was very helpful with any questions we had and was very attentive to detail. Had a wonderful stay. Incredible Home, can I move in? We came here for my sister's Bachelorette weekend. While the weather didn't agree with us (it was cold!) we had an AMAZING time hanging out in the hot tub grotto and swimming in the pool. At night we enjoyed the fire pit and made s'mores. Really, every amenity you could ever need is there. We were really looking for a house that we would all want to hang out in all day Saturday and boy, did this place deliver. I will definitely be staying here again when I come back to Austin. Basically this is my dream home for the day I am ready to become a homeowner myself. Jonathan was super available via text prior to arrival and for the few questions I had while in the home. The smart home features were awesome as well. STAY HERE --you won't be disappointed. Resort vacation in the heart of Austin! We love staying here -the kids call this our “awesome-Austin-house”!!! Everything about the stay is so wonderful -from the moment we walk in the door we are immediately on vacation mode! Absolutely everything you could ever need to relax and enjoy your stay is at your fingertips! The smart house technology makes everything about managing lights, music, pool fun and easy so that you can fully utilize every moment of your stay. We will always look forward to staying at this lovely home! We traveled to Austin for a girls weekend and this was a perfect house. Plenty of rooms, quiet neighborhood, clean, amazing backyard, pool and hot tub. The location was perfect and we walked or took a quick Uber everywhere. Johnathan was amazing to work with and responded within minutes prior to our trip and during our stay. Highly recommend! Amazing property with everything you could need for a weekend getaway home. Great location in Austin and amazing backyard/pool. Jonathan was incredibly accommodating and responsive. Minutes away from the heart of Austin. Explore the Capitol, Eat at a wide range of Food Trucks, Make a Splash on town lake with many activities available by the hour.